The Canadian Opera Company has revived its 2014 production of Mozart’s Così fan tutte directed by Atom Egoyan. 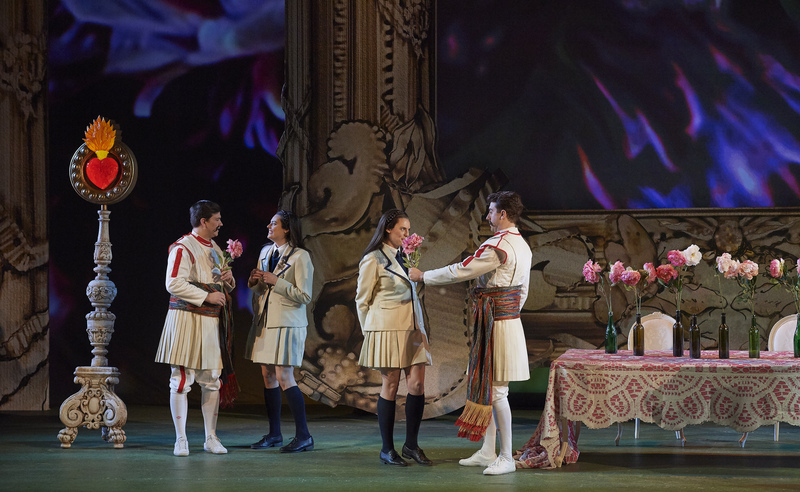 For this production, the director takes the opera’s secondary title, “The School for Lovers,” literally and sets it in what looks like an Edwardian-era boarding school which he packs full of naturalist symbols like giant butterflies. The end result is decidedly mixed. There are some aspects of the production I loved and other aspects that I found absolutely frustrating. This Italian-language comic opera debuted in 1790; the title roughly translates to “All Women Do It”—the “it” refers to cheating on their lovers. The plot involves a wager between two army officers, Guglielmo and Ferrado, and an old philosopher, Don Alfonso. The men insist that their lovers, sisters Fiordiligi and Dorabella, will remain faithful to them; so Don Alfonso concocts a scheme whereby the men would be called off to war only to return in disguise to attempt to seduce the sisters. If the sisters give in to the seduction Don Alfonso would win the bet and prove his point that all women are fickle. For this production, Egoyan styles Don Alfonso (Canadian Baritone Russell Braun) as a professor at this school for lovers. His wager is a lesson for his class (comprised of the members of the COC chorus) who diligently observe the goings-on and scribble notes. As for Dorabella (Mezzo-soprano Emily D’Angelo) and Fiordiligi (Soprano Kirsten MacKinnon), in this version of the opera the director smartly chose to make the sisters aware of the men’s wager. The fact that the women are in on the game means they have a degree of agency. They’re not portrayed as delicate little flowers; merely props to be manipulated by the men. In this new context, the sisters constantly trade knowing glances and sing through barely-contained smirks. When they pine for their absent lovers, it’s done in such an exaggerated, over-the-top manner that it absolutely drips with sarcasm. It’s delightful to watch. I thought this directorial choice was brilliant as it shifts the power-dynamic between the characters and tempers the overt misogyny of the piece. Unfortunately, the fairly taut production of the first act begins to unravel in Act II. The classroom set of the first act is replaced by a giant projection screen displaying an image where the camera pans and zooms around Frida Khalo’s iconic painting The Two Fridas. Maybe I just don’t get what the director is going for but I think the relationship between the painting and the opera is too specious for it to be given such a prominent place in the mise-en-scène and I found it very distracting. I also found the symbolism of the butterflies laboured—just like love, when you capture a butterfly and pin it down to examine it, you kill it—on top of being a little too on-the-nose it’s also a little too in-your-face. The giant butterflies that descend from the skies and light up may have been intended to make the scene look surreal but they ended up being just another distraction. Even though the production itself is a mixed bag, fortunately it sounds absolutely gorgeous. Under maestro Barnard Labadie’s baton, the COC orchestra practically bounces with energy as it plays Mozart’s buoyant score carefully expressing the various shades and colours in the orchestrations. Soprano Kirsten MacKinnon turns in a commanding performance as Fiordiligi. In her Act I aria “Come scolglio,” a notoriously challenging one in the soprano repertoire, she effortlessly flits between the low and the high notes. Her voice also blends beautifully with Mezzo-soprano Emily D’Angelo’s as Dorabella. Their harmonies hang in the air like the scent of sweet floral perfume. Tracy Dahl, showcases both her bright, robust soprano voice as well as her impeccable comedic acting chops as Despina, the maid. She is an absolute hoot to watch. American tenor Ben Bliss as Ferrando (Dorabella’s lover) has a warm, youthful timbre to his voice that exudes an innocence that belies his character’s devious machinations. His Act I aria “Un’aura amorosa” comes across as remarkably tender and sympathetic. Overall, This production of Così fan tutte is well worth a listen, even if the production may be a bit bewildering at times. Consult the schedule for show times. Tickets are available in person at the Four Seasons Centre for the Performing Arts box office (145 Queen St. W.), by phone at 416-363-8231 or online at coc.ca. Absolutely the reference to Frida Khalo is unfortunate. For me it crucified the genre of comedy. What was he thinking?